The post is still up. I do not know whose idea it is, but I will prove that they are mistaken about my football. I'm not a right defender, I'm an attacker who scores goals. This is my DNA. Happy to score 3 goals and help the team in today’s win vs Leicester. It's Klopp who has decided to pick him as a defender. That's not great. It must beabout 2 months now since he first said he would not sign a new contract. I was under the impression he felt it would be to difficult for him to get first team football at Liverpool. He is probably right there but bleating about being asked to play RWB suggests he lacks a bit of character. Most young lads would give anything for the opportunities he is getting. Unfortunately then he won't be an attacker in the Liverpool team - he just isn't really close to the level required to play as part of that front three. Should make a nice profit on his sale and hopefully he goes and tears it up somewhere. I thought his contract was ending and he would go on a freebie. His contract expires on 30th June 2020. Oh yes.... curtains for the boy for sure now. Rafael Camacho has hit out at Jurgen Klopp and his staff for using him out of position, following scoring a hat-trick for the U23 side. Needless to say the City game in the final will be a tough one. Their midfield player Tom Doyle has only quite recently started to look like a genuine prospect (even though he has been England captain for years). Seems Camacho could end up joining Wolves. It gives us some leverage if we were to negotiate for Neves. That said, at his current level, I dont see him breaking into their current side. Maybe he'll prove me wrong. We don't really play with wingers and it's not easy to break in our forward line. Tactically and physically very demanding. Plus, if the boy is impatient, then I'm not surprised if Wolves (with their strong Portuguese link) are taking a punt on him. Might be easier for him there at lower level also with them playing a different system where he might have more positions to get a chance. I like the kid how he plays, but sometimes it's not easy to please every young player at all times. Interesting to see Camacho's latest comments yesterday, suggesting that his comments have been taken out of context. Might still be in with a chance of seeing him stay. Watched a decent amount of his games throughout his Liverpool youth career. Could be a decent backup but will not be good enough in my opinion to break into our first team. Wouldn’t be a loss if he left to be honest. Larouci looks a much better prospect for the lb role then Lewis imo. Neither being good enough for next season. What happened to Juanma? Seems to have disappeared off the radar. He still plays for the u23's, he wont make it here anyway, nowhere near the standard imo I imagine he'll be released in the summer. As an Irish man could anyone tell me how Kelleher,Masterson,McAuley etc.. are doing ? Do they look able to make the jump? McAuley, again looks unlikely to make it, struggled in U23 football, after finding U18 fairly easy, there hasn't been an out and out striker in U23's this year with the likes of Jones, Woodburn and Camacho being used up front. Likely to be moved on, due to the fact thats there's Brewster needing game time, plus after there dominance at U-18, Duncan and Glatzel will probably move up full time next year. Interesting snippet from Neil Jones on the Anfield Wrap. A while ago Liverpool staff visited Athletic Bilbao for some pointers on youth development and spent some time with their coaching team. Bilbao have a track record of being huge numbers of academy graduates into the side, apparently because they can only play basque players. 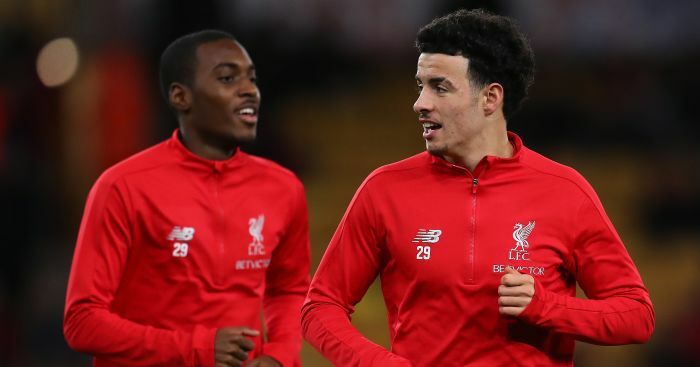 One of the things Liverpool came away with was that they don’t take a load of young players and see which rise to the top. They identify the next first teams very young - like 10 years old - and then work extensively with them. This is brutal for the kids that are written off at a young age, but this is about getting 7-8 lads at a time ready for playing in the Athletic Bilbao first team, and everything is boned towards getting these kids honed in the skills and abilities they need. I suspect this led to the creation of the ‘talent group’ and probably influenced the merging of a Melwood and Kirby. It’s a brilliant strategy from Bilbao to produce future talents. I personally feel the problem especially with English clubs is that they bring in hundreds of kids over age groups and just pick out the best ones every year and drop players without proper thought, not giving specific focus and attention to lads who may be decent but lack in certain aspects. Height for example is an example I have seen while working for clubs academies over here in Ireland, for example for centre half’s any child that’s considered to small or weak is gone no consideration given. Instead we should take a leaf from these clubs like Bilbao who only have a limited pool of youngster that can build foundations with these lads , if they are a small centre half focus on pace and strength to add to their game like Puyol or Cannavaro did. Think it is a major issue in academies in the English leagues, academies are treated like manufacturing factories rather than development facilities. It is affecting the homegrown game in the premier league aswell as lads at a young age who are big are chosen over naturally talented smaller lads as the ‘big’ lads are more effective at youth level, then suddenly as everyone evens out strength and power can’t be used to win as much. Just my thoughts but I feel if we can start to get ideas from world renounced academies such as these, the future of the English and Irish national teams will be more likely to progress to the level of the German,Spanish and French teams. Where do Bilbao usually finish in their domestic competitions? Their performance is very good considering the self-imposed restrictions. They have qualified for the CL a couple of times in the modern era, but over the last decade or so they have only missed out on Europe a couple of times. Yeah, I think that's what Mascot might have been referencing at the end. I'm in two minds about it. I think it's too early to be making your mind up about a player at 16 or younger. You've been through it mate, what do you think? Another aspect is that I think solidarity payments need to be increased and be extended to all transfers, not just international ones. That's linked to the size of academies but probably a discussion for another day. I get your reservation, but I don’t think this change in philosophy would have meaningfully altered the wrong-headed thinking I was exposed to. What I experienced was primarily a system that prioritized the wrong things, and if that is the case it doesn’t matter how long you keep the kids around or how big the group is. However, my understanding is that shrinking the group is a secondary response. The primary shift is a more aggressive promotion of the more talented kids up the age groups. It might make each team less competitive in the short term, but the long-term prospects for the individual are improved, supposedly. The knock on effect is fewer games available for the marginal kids in that age group. The decision is therefore to let them move on to somewhere they will be more important and get the attention they need to maximize their own potential.